MEMPHIS, Tenn., /PRNewswire/ -- Celebrities including Bon Jovi, Drew Barrymore, Florida Georgia Line, Ludacris, Luke Bryan, Reba McEntire, Twenty One Pilots and Vanna White will be wearing and sharing a T-shirt with a simple yet compelling message as they team up with St. Jude Children's Research Hospital® to kick off a new year of This Shirt Saves Lives. The national #thisshirtsaveslives campaign that caught on through social media has inspired a widespread giving movement to support the lifesaving work of St. Jude. 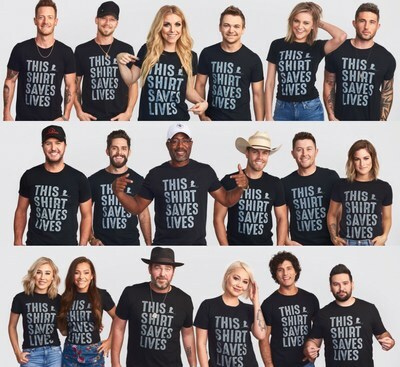 The movement has grown to encompass hundreds of celebrities, influencers and radio stations as well as thousands of supporters who took to their social channels with #ThisShirtSavesLives images and messages. So far, the effort has reached tens of millions of people across digital channels and helped lead to more than 90,000 monthly donors who have gotten behind the St. Jude mission: Finding Cures. Saving Children®. Once again, the campaign will be supported by St. Jude radio partners to cover more than 150 markets in December. Nationally syndicated personality Bobby Bones will lead the way with a live on-air event December 6-7. The on-air push will coincide with a social push as artists and influencers share their This Shirt Saves Lives photos. Additionally, John Shearer photographed dozens of celebrities to support the movement, with the images featured on social media, appearing in various outlets and available internationally via this special Getty Images gallery. "Over the years I've worked with St. Jude, I never cease to be amazed by all of the good that they do," said White. "Every time I visit, I hear about new initiatives and stories from patients that blow my mind and solidify that my support is in the right place." Others joining White for the launch are Ashlee Simpson Ross and Evan Ross, Ashley Tisdale, Brett Eldredge, Dan + Shay, Darius Rucker, Dustin Lynch, Scott Hamilton, Hunter Hayes, Journey, Kelsea Ballerini, Lady Antebellum, Lauren Daigle, Luis Fonsi, Scotty McCreery, Shawn Johnson, The Avett Brothers, Thomas Rhett and many others. "Such a simple gesture as wearing a T-shirt has made a giant impact on the lives of children facing cancer and other life-threatening diseases," said Richard Shadyac, Jr., President and CEO of ALSAC, the fundraising and awareness organization for St. Jude Children's Research Hospital. "We are incredibly grateful for our supporters, including our many celebrity friends who have helped make This Shirt more than just a fashion statement and turned it into a true movement for good." St. Jude officially launched this year's campaign with a star-studded concert in Nashville that featured performances by several country music artists and the talents of top fashion designers who helped to unveil the new version of the shirt, which is black with bold white lettering that says "This Shirt Saves Lives." 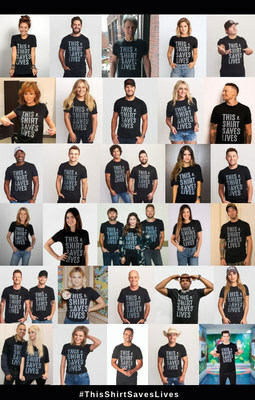 To join the This Shirt Saves Lives movement by becoming a St. Jude monthly donor, visit: thisshirtsaveslives.org. St. Jude Children's Research Hospital is leading the way the world understands, treats and defeats childhood cancer and other life-threatening diseases. Its purpose is clear: Finding cures. Saving children.® It is the only National Cancer Institute-designated Comprehensive Cancer Center devoted solely to children. Treatments invented at St. Jude have helped push the overall childhood cancer survival rate from 20 percent to more than 80 percent since the hospital opened more than 50 years ago. St. Jude won't stop until no child dies from cancer. St. Jude freely shares the discoveries it makes, and every child saved at St. Jude means doctors and scientists worldwide can use that knowledge to save thousands more children. Families never receive a bill from St. Jude for treatment, travel, housing or food – because all a family should worry about is helping their child live. Join the St. Jude mission by visiting stjude.org, liking St. Jude on Facebook, following St. Jude on Twitter and Instagram and subscribing to its YouTube channel.